The trouble with part-time bookkeepers is they only work part-time. There’s not enough work or money coming in to employ someone full-time so it saves you money and makes sense right? But let’s say one of your suppliers calls when your part-time bookkeeper isn’t around and wants to be paid – what do you do? Do you go ahead and pay them what they want and risk paying them twice or do you try to get hold of your part-time bookkeeper to check? What if you want to find out how much you have in the bank after all the cheques have cleared – your real bank balance? 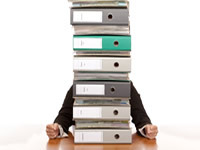 Your part-time bookkeeper isn’t in til Friday and you need this information now! What’s more you have to pay them when they are holiday and off sick and bank holidays. Add to that employers national insurance. Doesn’t sound quite so appealing now does it. So what’s the alternative? Simple. Just pay for the time you use but have the peace of mind knowing there someone will be at the end of the phone or email from Monday to Friday to answer any of your questions immediately. We agree a monthly rate with no further hidden costs. You don’t have to supply the accounting software or even pay the annual support contract, which can run into hundreds of pounds. We supply all that giving you access to a full time accounts department at a fraction of the cost. And as we aren’t an employee there are no extra costs for holidays, sickness or national insurance either. People say you only get what you pay for but with us you only pay for what you get.